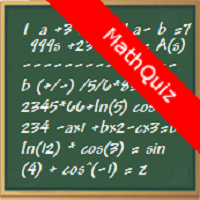 MathQuiz - With Math Quiz you can test your mental math skills. If you are bored of Sudoku or if you love Sudoku, Math Quiz is exactly the right thing for you. The goal in Math Quiz is to solve all the equations, but careful, the equations are connected with each other. Impress your teachers with your math skills you learned in Math Quiz. Friends! Do you get really bored with your homework's and with the routine calculation of the basic mathematical shapes or formulas? Are you a learner of mathematical calculations?